A single coconut will give you 3 or 4 cups cups of fresh, flaked coconut. But now you have the problem of storing fresh coconut. How do you keep that delightful, flaky bit of goodness in a state that will stay edible for as long as possible? This tutorial shows tips for storing fresh coconut as well as how to buy, open, and use the coconut meat in your favorite recipes. This tutorial will show you how to buy the best coconuts, how to crack them open and how to store that delicious coconut meat to keep it from going bad. I love anything coconut. The milk is wonderful as a base of many recipes, including Indian curry dishes. Flaked coconut makes a wonderful addition to frosting recipes, and pieces of fresh coconut make a healthy and nutritious snack. Fresh coconuts have a dark brown outer shell, tasty milk and pure white flesh, (also called coconut meat) that is perfect for all sorts of recipes from savory dishes, to sweet treats. One of the keys to maintaining the freshness of coconut is making sure that you keep it cool and dry. A note on calories: Coconut is not really the best choice for you to eat liberally if you are counting your calories. Although it’s considered a healthy food, coconut is relatively high calories, though most of them come from good fats. Coconut milk is a great dairy substitute and coconut oil is a preferred oil for cooking for Paleo, Vegan and Whole30 diets. Since all of the coconut can be used in the kitchen, you will want to know how to make it really last. You don’t have to make a trip to the tropics to enjoy fresh coconut. 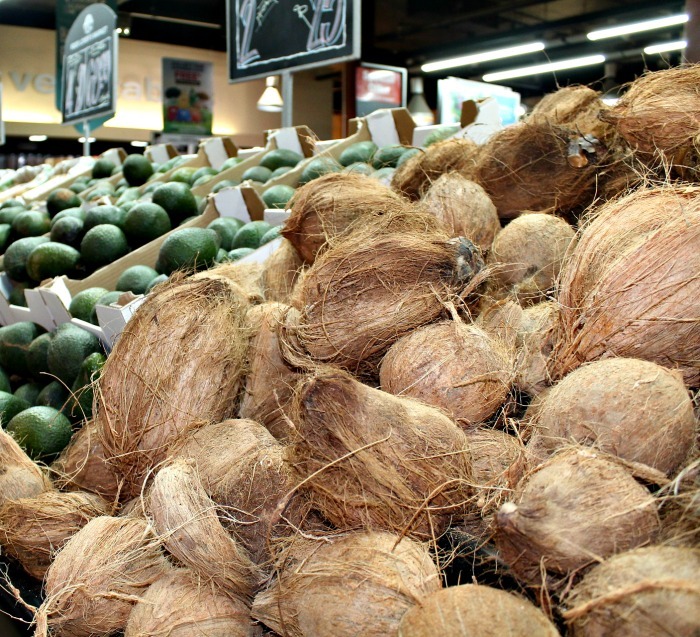 Many stores and Farmer’s Markets sell coconuts year round. To choose a good one, lift it. A healthy and tasty coconut will feel heavy for its size since it normally means that it has more liquid inside. Give the coconut a good shake, too, to make sure that you hear plenty of water moving around inside the shell. A lot of liquid means that the coconut is fresher. A coconut has eye holes on the end stem. Examine them to make sure that there is no mold or moisture there. Even if you hear a lot of liquid inside the fruit, if that water shows near the eyes, it could mean that it is starting to mold. This section of moisture may be most obvious around the area of the softest eye. 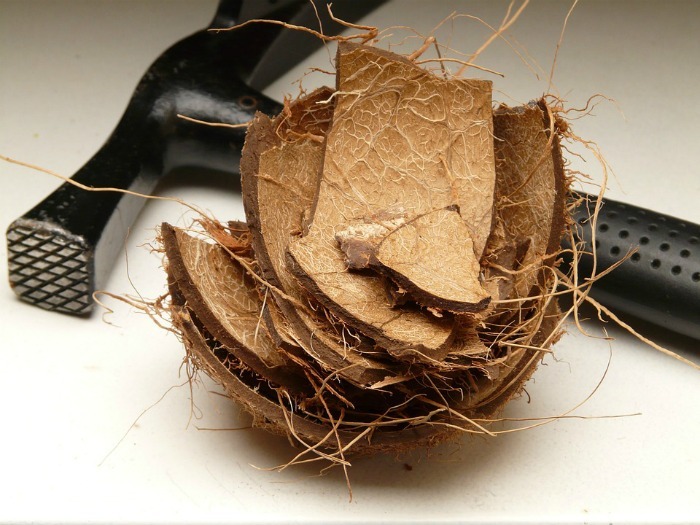 Examine the other areas of the coconut shell. If you see any visible cracks, areas of mold or wet spots, give that coconut a miss and buy another one. In the photo above, the eye on the right side is darker around the edges and looks a bit different. It is also more rounded. 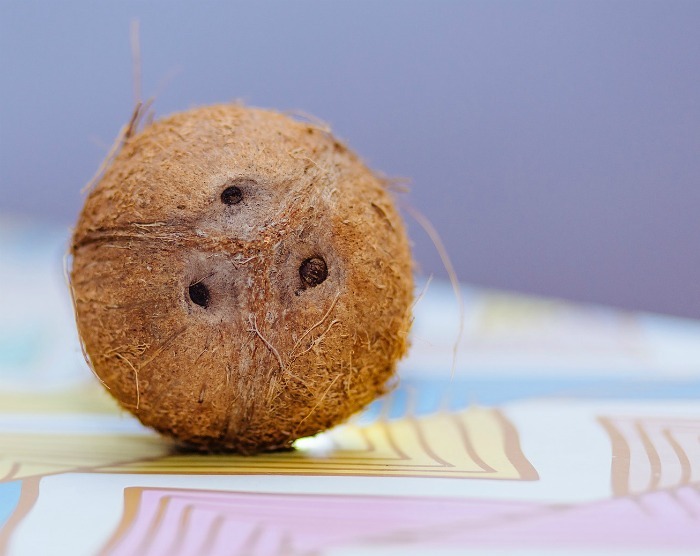 Use a screwdriver to gently make a hole in the softest coconut eye and the other two eyes. Just press the point of the screwdriver into the eye and tap it with a hammer to go through the flesh until you reach the center. The coconut water is quite nutritious and can be used in recipes to add flavor to sauces and other drinks. Use a hammer to hit the center of the coconut while you turn it. Just keep hitting and turning the coconut until you see a fracture line start to form. You don’t have to hit the coconut hard. Just gently hit it as you rotate it and it will open. It will normally pop into two pieces. Use a butter knife to pry the coconut from the shell. The meat can be tough to dislodge. It works best if you push the knife in as far as you can to try and get big pieces of coconut meat. 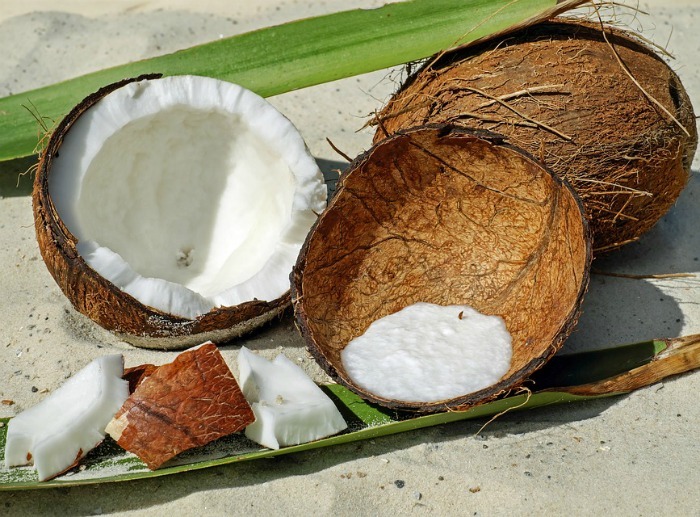 If the liquid from the coconut tasted bitter, it may mean that the coconut meat will not taste very sweet. Be sure to examine it when you get it open. Any yellow flesh should be discarded but the pure white flesh should taste just fine. Once you have brought home a fresh coconut, it will stay fresh at room temperature for up to four months as long as you keep it in a cool. dry spot. Storing fresh coconut meat is easy. The trick is keeping it cool. Here are some tips to make sure that it stays fresh as long as possible. Fresh un-cracked coconuts can be stored at room temperature for up to four months, but this depends a bit on their original freshness when they were purchased. Once the coconut has been cracked, place the fresh coconut pieces into a plastic container or zip lock bag. 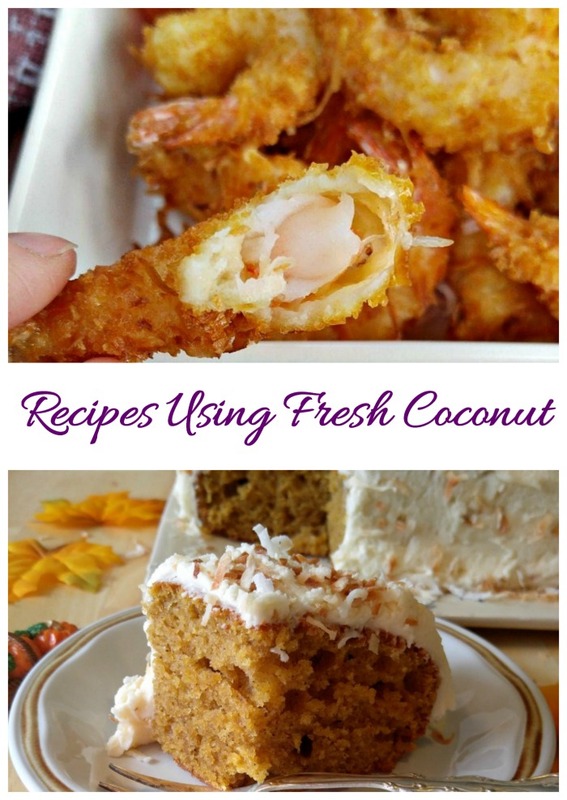 You can use either shredded fresh coconut or chunks of fresh coconut meat. Place the container into the refrigerator. The un-shredded fresh coconut will keep for four to five days. Refrigerate shredded fresh coconut will only last one to two days, so it is best to shred it right before you need to use it. For longer storage, grate the whole coconut pieces, squeeze out the liquid and place in the freezer. Be sure to leave some room in the container for expansion when freezing. It will keep for up to four months stored this way. It is best to use fresh coconut quickly if you can. Their high oil content makes coconuts turn rancid quickly if you do not store them properly. Asian, Indian and Latin American cuisines use coconut meat to give meals a wonderfully rich, subtle flavor. You can use the flesh or water to make soups and stews as well as curries. Most modern cooks think of coconut for using in puddings and baked goods but there are so many other ways to use it. Your coconut won’t have a chance to spoil if you use it in several of recipes! Cashew Coconut Energy Bites – Paleo and Gluten Free! Pumpkin Cake with Toasted Coconut Frosting – My mother used to make this every Thanksgiving. Whole30 Coconut Apple Breakfast Bowl – a nice change from eggs on Whole30. Easy Beer Battered Coconut Shrimp – Perfect for game night. Sweet Corn and Coconut Pudding – A Brazilian favorite. Easter Egg Nest Cupcakes – add some gel dye to your coconut to make little nests. 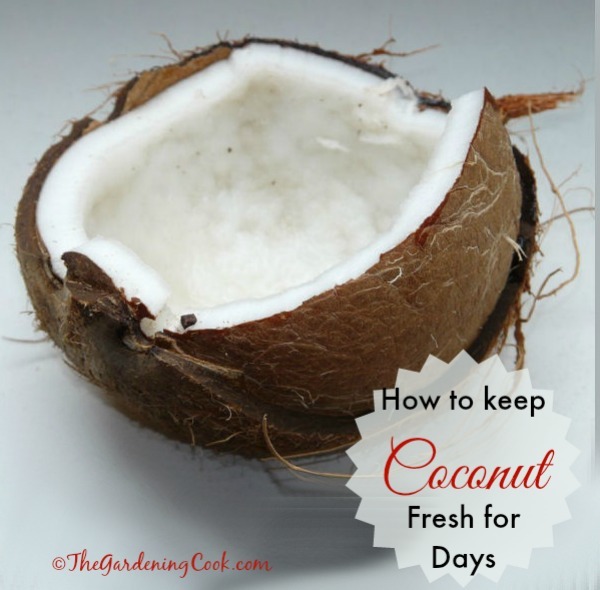 There are so many uses for fresh coconut. Shred it and add it to curry dishes. Cut it into thin strips and heat it in a skillet over low heat to make “coconut toast,” and make coconut milk by combining the coconut meat and water in a blender. 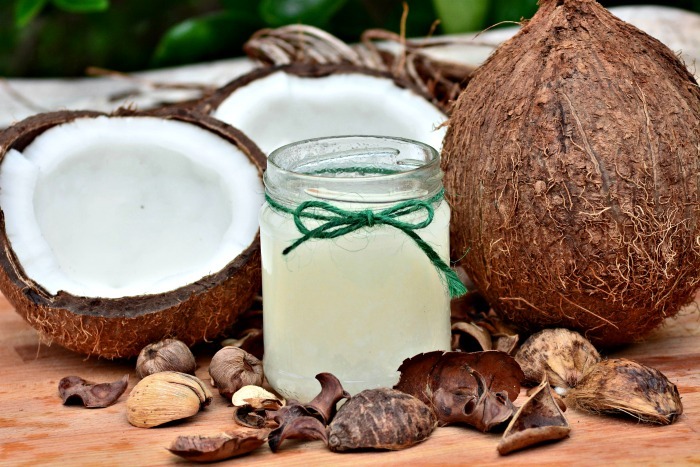 Do you enjoy cooking with coconut oil? It’s not just for recipes. There are so many other ways to use coconut oil in the home. Check them out! 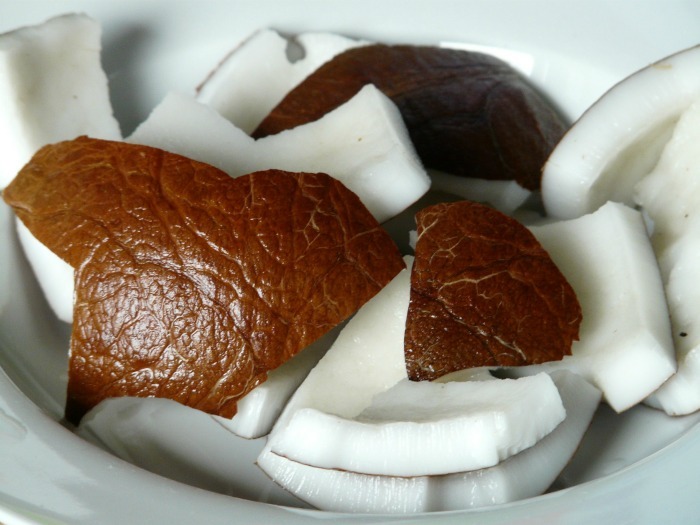 Do you just snack on your coconut meat or do you use it in recipes? I’d love to hear your ideas in the comments below. Admin note: This post first appeared on the blog in August of 2013. I have updated the post to show how to buy and open a coconut, as well as giving ideas for recipes to use the meat.